As a boutique steel fabrication company, BridgeFab works on projects big and small. Our ability to fabricate steel to any shape and size makes us the go-to steel fabricator for all your needs. 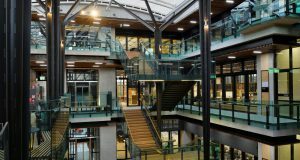 While we are better known for our work on buildings such as UQ’s The Global Change Institute and the Helensvale Library, BridgeFab also carries out the metalwork side of business. What this does for our clients is allows them to get everything they need from the one company. We have the skilled teams to do everything from drafting through to steel erection. 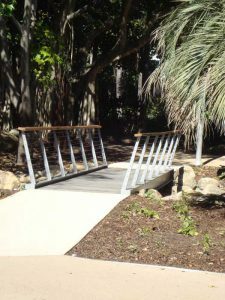 In this photo of UQ you can see the handrails and the tree-like steel-supports. While there are those steel fabrications who don’t do metalwork, BridgeFab believe part of our customer service is helping clients by providing all their steel fabrication needs. Because BridgFab are happy to do the necessary metalwork on such a project, a second company did not need to be sought out. Need architectural steel? BridgeFab can do it. Need barbecues in the park? BridgeFab can do it. Need handrails done? BridgeFab can do it. 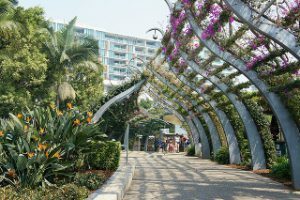 Whether it’s the tree-like steel in University of Queensland’s Global Change Institute, or the Southbank Grand Arbour, BridgeFab has the technology and the tools required to carried out jobs big and small. Using 3D scanning, BridgeFab can recreate in virtual space, the area which needs to be worked on. This allows us to create the steel in 3D and plan where each piece of steel needs to go before we start fabricating. Which means we are able to fabricate steel knowing exactly where each piece goes and we don’t have to worry about if each piece will fit. While BridgeFab is a skilled and experienced at fabricating boutique steel and metalwork, we also have your basic metalwork covered. From handrails and park bench rests, BridgeFab can do it. And doing this is part of what makes us a one-stop-shop boutique steel fabrication company. You don’t need to hire draftsmen, and a steel erection company, and a metalworking company as well as BridgeFab: all you need to do is work with us and will carry out all of it.